Biological activity in the soil is imperative to the development of vigorous, disease- and pest-resistant crops in the garden or field. Fungi, and bacteria are beneficial soil organisms that have a symbiotic relationship with the plant through its root system. They also play a major part in the breakdown of organic matter and the freeing of nutrients that may be in the soil, yet unavailable to plant roots. Some fungi even produce antibiotics that protect the plant from disease. 95% of plant species have a relationship with fungi. Mycorrhizal (my-ko-rize’-ul) fungi have an elaborate root system of fungal filaments that grow yards, both deep into the soil and in the root zone. Several miles of these filaments can be found in a few grams of soil. 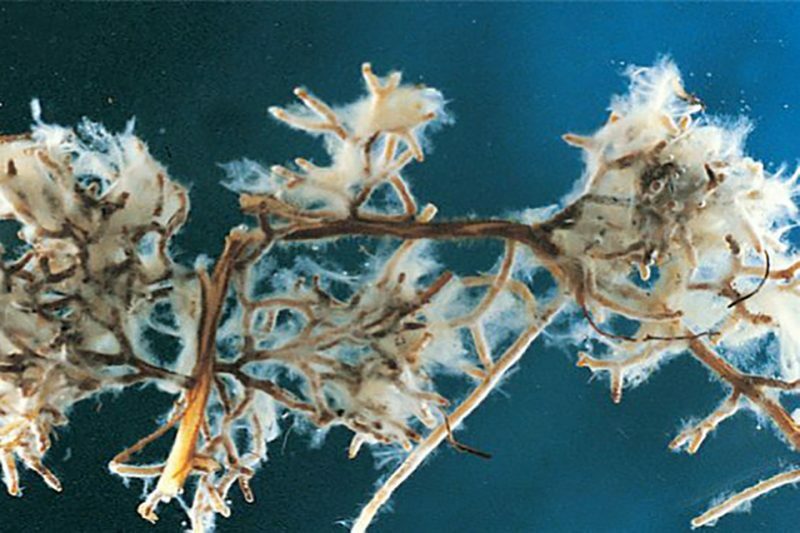 Mycorrhizal fungi seek out moisture and nutrients and bring them back to the plant roots. Therefore, the surface absorbing area of plant roots can be increased hundreds of times. Myco means fungus. Rhizae comes from rhizome, meaning roots. This translates into fungus root. There are two types of mycorrhizae, (my-ko-rize’-ee) Endo-mycorrhizae, and ecto-mycorrhizae. Endo-mycorrhizae (meaning inside) actually penetrate the tiny root hairs of plants without changing the root’s cell structure, effectively extending the plants root system. The fungi bring moisture and nutrients back to the roots and in turn, the roots share sugars and other carbohydrates with the fungi. The fungi also release powerful enzymes that dissolve, and make available, nutrients that are tightly bound and difficult to access. Phosphorous, for example, a very active mineral with a strong negative charge can bond with Calcium, which has a double positive charge. The result is Calcium phosphate, a very stable compound. The enzymes break the Calcium/Phosphorous bond making the Phosphorous available for uptake by the plant roots. 90% of cultivated plants have a symbiotic relationship with endo-mycorrhizae. Ecto-mycorrhizae fungi (meaning outside) grow next to plant roots but live completely outside of the roots. They share nutrients with the plant roots through the soil water/nutrient solution. Certain types of bacteria, called rhizobia, live in symbiosis with legumes such as red clover, cowpeas, and alfalfa. These bacteria form and inhabit nodules on the roots of legumes and are able to take Nitrogen from air in the soil and create ammonia, which the plant uses to create amino acids and other compounds. The rhizobia in turn receive carbohydrates from the plant. These Nitrogen-gathering or Nitrogen-fixing bacteria are not found on common crop plants except legumes. Green manure is a rich source of Nitrogen for the soil and comes from turning these legumes under in your garden or field. Some soil inoculant products contain numerous species of endo-mycorrhizae, ecto-mycorrhizae, and beneficial bacteria. When used, the species that are right for a given soil and climate will adapt and thrive. Soil inoculants increase the capacity of roots to absorb water and nutrients resulting in improved plant vigor, health, quality, and yield. Whatever crop you are growing, enhancing biological activity in the soil vastly improves the crops capacity to reach its full genetic potential. Soils that are out of balance and lacking in needed minerals will most likely have a limited amount of biological activity. But when mineral nutrients are balanced and brought up to optimum levels, the fungi and bacteria will have something to work on and the soil will come alive. Using biological activators, or soil inoculants, will enhance and expand that activity by ensuring the bacteria and fungi that will best adapt to the soil and climate are present. Bring your soil into balance with a custom soil prescription and amendment blend. Check out Step One to get started.